The Village Leisure extension at the White Rose Shopping Centre, Leeds, has been shortlisted in the Commercial category for the RICS Awards 2018 Yorkshire & Humber which recognise the most innovative projects in the region and their impact on local communities. Designed by The Harris Partnership for Land Securities, the £15m leisure extension provides an 11-screen IMAX Cineworld and six new family friendly-restaurants including Wagamama, TGI Friday’s, Chiquito and Pizza Hut alongside new public realm features including event space and uniquely designed children’s play area. 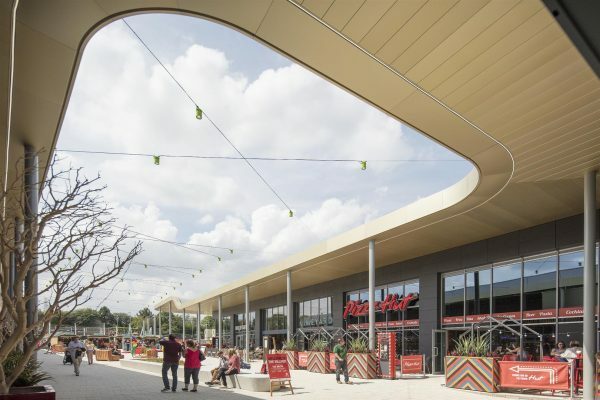 The extension and new outdoor areas are credited with attracting further tourism to the local area through events such as Christmas markets and planned summer pop-ups, and with creating around 350 new jobs since opening. Final winners will be revealed at an awards ceremony to be hosted by News Broadcaster, Clare Frisby at Centenary Pavilion, Leeds United Football Club on Friday 11 May. This will be the second occasion The Harris Partnership has been represented at the awards having won in 2015 for our innovative design for The Blackburn Wing at Bowcliffe Hall near Wetherby. Here’s to a repeat performance!